Hurricane Maria: A First-Person Account | Kid Reporters' Notebook | Scholastic Inc.
On September 20, Hurricane Maria slammed into Puerto Rico, a United States territory located in the Caribbean Sea. It was the most powerful hurricane to hit the island directly since 1928. Strong winds, mudslides, and flooding damaged entire neighborhoods. Many areas still do not have electricity or clean drinking water. Food and gasoline are scarce. Most schools remain closed. During the hurricane, my family and I were in our apartment, which is on the 11th floor. At about 1 a.m., the electricity went out in our building. Rain began to pelt our windows like bullets. There was a weird screeching sound that got louder and louder. It was the wind. I couldn’t sleep, so I stayed up with my parents in the living room, which had the most light. At about 4 a.m., our building started to sway. It felt like an earthquake. I thought that the windows would shatter, so I took shelter in the bathroom. I was frightened for my life. Using the remaining battery charge on my phone, I texted my friends to tell them that I love them. My mother called for me to help push the couch against the front door so that it wouldn’t burst open. I hoped that our apartment wouldn’t be completely destroyed. I also feared for my friends who live right on the coast. By noon, the winds had died down, and we were able to go into the kitchen for some bread and cheese. We were starving, tired, and sweaty. We checked the apartment and found that only the front door had been damaged. When it was safe to go outside, we went to the parking lot to check on our car and charge our phones. I had several missed calls from friends and family members who were worried about me. The cell signal would go on and off, so we sometimes drove to a certain spot on the highway where we could get a signal. In the following days, we drove around for hours, looking for a place to get food. If we found a restaurant that was open, usually there was almost nothing left. A week after the storm, I went to my school to help clean up the debris. Because the school had a generator and could gain access to water and electricity, we were able to resume classes on an abbreviated schedule. Other kids are not as lucky. Most schools are not expected to reopen for several weeks. 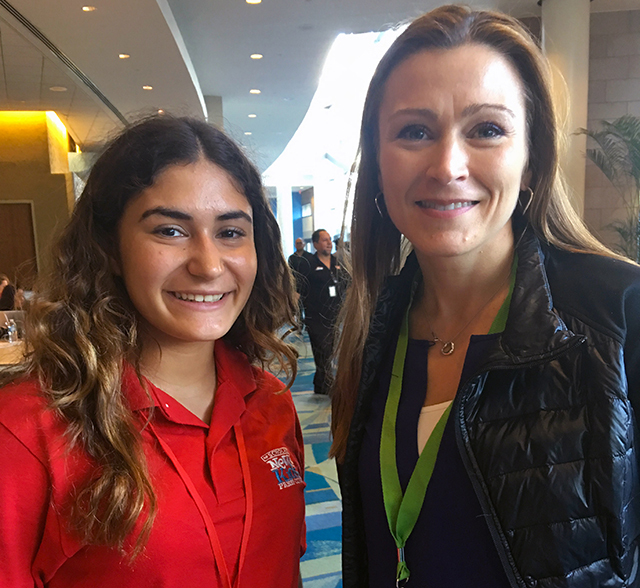 When I spoke with Julia Keleher, Puerto Rico’s Secretary of Education, she said that officials are doing everything they can to get kids back into their classrooms. Many students living in poverty rely on schools for meals and clean water. Several of my classmates have left for the United States. Some may never return to Puerto Rico. It’s sad when you’re used to seeing people your entire life, and suddenly they’re gone because they no longer have a home, or their parents don’t have a job. You feel so empty without them. You even start to miss people you didn’t talk to that much. Other people on the island have lost much more. Entire communities have been destroyed, and at least 48 deaths have been confirmed. Thousands of people, especially in rural areas, do not have access to food, safe drinking water, or medical care. I’ve tried to stay busy by keeping up with the news and doing community service. My reporting for Scholastic has allowed me to see that many people in the United States and other countries care about us and want to help us rebuild. That really keeps us going. I’ve learned to never again take everyday things for granted, even a meal. My greatest hope is that all of the vegetation that has been lost will one day grow back on the island. Right now, I’d be satisfied if we had enough electricity to communicate with each other. I spent the hurricane with my family in a hotel. At first, I thought it would be a great experience because it sounded a lot like a vacation. But it turned out to be very scary. At around 2 a.m., all of the guests were told to go into the lobby using the emergency stairs because the rooms were unsafe. I was really scared, but my older brother, Carli, kept telling me jokes and sang songs with me, which really helped me calm down. It is not something I would ever want to go through again. I ask for help for our island because we’re running out of food and water and basic goods needed for survival. I was sleeping, and the power went out. The wind was blowing with a very weird sound that sounded a lot like bullets against the glass windows. It continued for at least six hours. I spent from 2 a.m. until the hurricane ended mopping the floors so that the whole house wouldn’t flood. The next day, we searched around the house. There was a lot of water in the living room, but no substantial damage. In our neighborhood, tons of trees fell, and a lamppost fell right onto the garage of my neighbors. We all helped them move the post so that they were able to get their car out of the garage. I want to ask that you continue to support us during this time of crisis. This was a tragedy, and we are trying to recover. Puerto Rico is probably never going to be the same again. I woke up at 4 a.m. because of the noise and wasn’t able to go back to sleep. I was very scared. The wind was so strong, it almost sounded like somebody was screaming. I was scared that our roof was going to fly off, or that my windows were going to break and that I’d be left without a home. I was really worried about my grandfather’s home because it is up in the mountains and made out of wood. He lost his house, along with many others in Puerto Rico. But he was fortunate not to have been there during the hurricane. It was one of the scariest experiences of my life, and I’m very fortunate to be safe and healthy. There are many others who are not. We need all the help we can get. Please see if you can volunteer somewhere close to your home. Any donations are greatly appreciated by us on the island. I was in a hotel during the hurricane because my home is right on the coast and consists of many windows. It was my first time experiencing a hurricane, and I was frightened that my home would not survive. I was unable to sleep the whole night because of the noise of the wind and the various ideas that filled my mind. The day after the hurricane, I visited my apartment. Many windows were broken, along with some furniture. Our sliding door completely flew away, and several tiles on our terrace were broken. There was no food, water or electricity in the apartment. My family decided the place was unsafe. Our family from Ecuador was extremely worried about us. They were not able to reach us due to the lack of a cell signal. Sadly, because of the damage to our home, we had to move back to Ecuador until January. When the hurricane started, I got a bit scared. But my mom told me that everything would be all right. I stayed with my brothers and sister and my parents in my room because it was the one room that didn’t have as many windows. I’m lucky that my school didn’t suffer much damage and was able to open up this week. My first day back didn’t feel the same. Most of my friends weren’t there. Thank you so much for caring about us. This experience has given me a different perspective about the privileges we have every day that many people take for granted. I learned that water, food, and electricity are like pieces of gold, very valuable. • United for Puerto Rico, an initiative started by First Lady Beatriz Rosselló, works with the private sector to bring aid and support to people affected by Hurricane Irma, which struck the island on September 7, and Hurricane Maria. • Led by Spanish-American chef José Andrés, World Central Kitchen has been serving tens of thousands of meals to families in Puerto Rico in the wake of the hurricane’s devastation. • The Hispanic Federation has established Unidos, a relief fund for hurricane victims in Puerto Rico and the Dominican Republic, as well as for people affected by the recent earthquake in Mexico.